A grebe (/ˈɡriːb/) is a member of the order Podicipediformes and the only type of bird associated with this order. Grebes are a widely distributed order of freshwater diving birds, some of which visit the sea when migrating and in winter. This order contains only a single family, the Podicipedidae, containing 22 species in 6 extant genera. Grebes are small to medium-large in size, have lobed toes, and are excellent swimmers and divers. Although they can run for a short distance, they are prone to falling over, since they have their feet placed far back on the body. Grebes have narrow wings, and some species are reluctant to fly; indeed, two South American species are completely flightless. They respond to danger by diving rather than flying, and are in any case much less wary than ducks. Extant species range in size from the least grebe, at 120 grams (4.3 oz) and 23.5 cm (9.3 inches), to the great grebe, at 1.7 kg (3.8 lbs) and 71 cm (28 inches). The North American and Eurasian species are all, of necessity, migratory over much or all of their ranges, and those species that winter at sea are also seen regularly in flight. Even the small freshwater pied-billed grebe of North America has occurred as a transatlantic vagrant to Europe on more than 30 occasions. Bills vary from short and thick to long and pointed, depending on the diet, which ranges from fish to freshwater insects and crustaceans. The feet are always large, with broad lobes on the toes and small webs connecting the front three toes. The hind toe also has a small lobe. Recent experimental work has shown that these lobes work like the hydrofoil blades of a propeller. Curiously, the same mechanism apparently evolved independently in the extinct Cretaceous-age Hesperornithiformes, which are totally unrelated birds. Grebes have unusual plumage. It is dense and waterproof, and on the underside the feathers are at right-angles to the skin, sticking straight out to begin with and curling at the tip. By pressing their feathers against the body, grebes can adjust their buoyancy. Often, they swim low in the water with just the head and neck exposed. In the non-breeding season, grebes are plain-coloured in dark browns and whites. However, most have ornate and distinctive breeding plumages, often developing chestnut markings on the head area, and perform elaborate display rituals. The young, particularly those of the Podiceps genus, are often striped and retain some of their juvenile plumage even after reaching full size. In the breeding season, they mate at freshwater lakes and ponds, but some species spend their non-breeding season along seacoasts. When preening, grebes eat their own feathers, and feed them to their young. The function of this behaviour is uncertain but it is believed to assist with pellet formation, and to reduce their vulnerability to gastric parasites. Grebes make floating nests of plant material concealed among reeds on the surface of the water. The young are precocial, and able to swim from birth. The grebes are a radically distinct group of birds as regards their anatomy. Accordingly, they were at first believed to be related to the loons, which are also foot-propelled diving birds, and both families were once classified together under the order Colymbiformes. However, as recently as the 1930s, this was determined to be an example of convergent evolution by the strong selective forces encountered by unrelated birds sharing the same lifestyle at different times and in different habitat. Grebes and loons are now separately classified orders of Podicipediformes and Gaviiformes, respectively. The cladistics vs. phenetics debate of the mid-20th century revived scientific interest in generalizing comparisons. As a consequence, the discredited grebe-loon link was discussed again. This even went as far as proposing monophyly for grebes, loons, and the toothed Hesperornithiformes. In retrospect, the scientific value of the debate lies more in providing examples that a cladistic methodology is not incompatible with an overall phenetical scientific doctrine, and that thus, simply because some study "uses cladistics", it does not guarantee superior results. Molecular studies such as DNA-DNA hybridization (Sibley & Ahlquist, 1990) and sequence analyses fail to resolve the relationships of grebes properly due to insufficient resolution in the former and long-branch attraction in the latter. Still – actually because of this – they do confirm that these birds form a fairly ancient evolutionary lineage (or possibly one that was subject to selective pressures down to the molecular level even), and they support the non-relatedness of loons and grebes. The most comprehensive study of bird phylogenomics, published in 2014, found that grebes and flamingos are members of Columbea, a clade that also includes doves, sandgrouse, and mesites. Many molecular and morphological studies support a relationship between grebes and flamingos. Recent molecular studies have suggested a relation with flamingos while morphological evidence also strongly supports a relationship between flamingos and grebes. They hold at least eleven morphological traits in common, which are not found on other birds. Many of these characteristics have been previously identified on flamingos, but not on grebes. The fossil Palaelodids can be considered evolutionarily, and ecologically, intermediate between flamingos and grebes. For the grebe-flamingo clade, the taxon Mirandornithes ("miraculous birds" due to their extreme divergence and apomorphies) has been proposed. Alternatively, they could be placed in one order, with Phoenocopteriformes taking priority. The fossil record of grebes is incomplete; there are no transitional forms between more conventional birds and the highly derived grebes known from fossils, or at least none that can be placed in the relationships of the group with any certainty. The enigmatic waterbird genus Juncitarsus, however, may be close to a common ancestor of flamingos and grebes. The Early Cretaceous (Berriasian, around 143 mya) genus Eurolimnornis from NW Romania was initially believed to be a grebe. If it is indeed related to this lineage, it must represent a most basal form, as it almost certainly predates any grebe-flamingo split. On the other hand, the single bone fragment assigned to this taxon is not very diagnostic and may not be of a bird at all. Telmatornis from the Navesink Formation – also Late Cretaceous – is traditionally allied with the Charadriiformes and/or Gruiformes. However, a cladistic analysis of the forelimb skeleton found it highly similar to the great crested grebe and unlike the painted buttonquail (now known to be a basal charadriiform lineage), the black-necked stilt (a more advanced charadriiform), or the limpkin (a member of the Grui suborder of Gruiformes), namely in that its dorsal condyle of the humerus was not angled at 20°–30° away from long axis of the humerus. The analysis did not result in a phylogenetic pattern but rather grouped some birds with similar wing shapes together while others stood separate. It is thus unknown whether this apparent similarity to grebes represents an evolutionary relationship, or whether Telmatornis simply had a wing similar to that of grebes and moved it like they do. 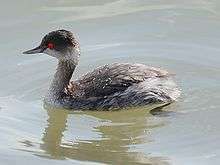 True grebes suddenly appear in the fossil record in the Late Oligocene or Early Miocene, around 23–25 mya. While there are a few prehistoric genera that are now completely extinct, Thiornis (Late Miocene -? Early Pliocene of Libros, Spain) and Pliolymbus (Late Pliocene of WC USA – Early? Pleistocene of Chapala, Mexico) date from a time when most if not all extant genera were already present. Only the Early Miocene Miobaptus from Czechoslovakia might be somewhat closer to the ancestral grebes, but more probably belongs to an extinct lineage. Indeed, Miobaptus is rivalled or even exceeded in age by a species of the modern genus Podiceps. Grebes date back very far and the Late Cretaceous bird Neogaeornis wetzeli may be their ancestor. Living Podicipediformes based on the work by John Boyd. Compiled from the following websites: Extinct species assignment follows the Mikko's Phylogeny Archive and Paleofile.com websites. and subspecies names from English Names of Birds. 1 2 Mace, Alice E. (1986). "Changes Through Time". The Birds Around Us (Hardcover ed.). Ortho Books. p. 30. ISBN 0-89721-068-9. 1 2 3 4 Fjeldså, John (1991). Forshaw, Joseph, ed. Encyclopaedia of Animals: Birds. London: Merehurst Press. pp. 59–60. ISBN 1-85391-186-0. ↑ Simmons (1956). "Feather-eating and Pellet-formation in the Great Crested Grebe". Brit. Birds. 49: 432–435. ↑ Stolpe, M. (1935). "Colymbus, Hesperornis, Podiceps:, ein Vergleich ihrer hinteren Extremität". J. Ornithol. (in German). 80 (1): 161–247. doi:10.1007/BF01908745. ↑ Cracraft, Joel (1982). "Phylogenetic Relationships and Monophyly of Loons, Grebes, and Hesperornithiform Birds, with Comments on the Early History of Birds" (PDF). Systematic Zoology. 31 (1): 35–56. doi:10.2307/2413412. JSTOR 2413412. ↑ Jarvis, E.D. ; et al. (2014). "Whole-genome analyses resolve early branches in the tree of life of modern birds". Science. 346 (6215): 1320–1331. doi:10.1126/science.1253451. PMC 4405904 . PMID 25504713. ↑ Chubb, A. L. (2004). "New nuclear evidence for the oldest divergence among neognath birds: the phylogenetic utility of ZENK (i)". Molecular Phylogenetics and Evolution. 30 (1): 140–151. doi:10.1016/S1055-7903(03)00159-3. PMID 15022765. ↑ Ericson, Per G. P.; Anderson, C. L.; Britton, T.; Elzanowski, A.; Johansson, U. S.; Källersjö, M.; Ohlson, J. I.; Parsons, T. J.; et al. (December 2006). "Diversification of Neoaves: Integration of molecular sequence data and fossils" (PDF). Biology Letters. 2 (4): 543–547. doi:10.1098/rsbl.2006.0523. PMC 1834003 . PMID 17148284. ↑ Hackett, Shannon J.; Kimball, Rebecca T.; Reddy, Sushma; Bowie, Rauri C. K.; Braun, Edward L.; Braun, Michael J.; Chojnowski, Jena L.; Cox, W. Andrew; et al. (27 June 2008). "A Phylogenomic Study of Birds Reveals Their Evolutionary History". Science. 320 (5884): 1763–1768. doi:10.1126/science.1157704. PMID 18583609. ↑ Mayr, Gerald (2004). "Morphological evidence for sister group relationship between flamingos (Aves: Phoenicopteridae) and grebes (Podicipedidae)" (PDF). Zoological Journal of the Linnean Society. 140 (2): 157–169. doi:10.1111/j.1096-3642.2003.00094.x. Retrieved November 3, 2009. 1 2 Mayr, Gerald (2006). "The contribution of fossils to the reconstruction of the higher-level phylogeny of birds" (PDF). Species, Phylogeny and Evolution. 1: 59–64. ISSN 1098-660X. Retrieved 12 August 2009. ↑ Benton, M. J.; Cook, E.; Grigorescu, D.; Popa, E.; Tallódi, E. (1997). "Dinosaurs and other tetrapods in an Early Cretaceous bauxite-filled fissure, northwestern Romania" (PDF). Palaeogeography, Palaeoclimatology, Palaeoecology. 130: 275–292. doi:10.1016/S0031-0182(96)00151-4. ↑ Cracraft, Joel. "Systematics and evolution of the Gruiformes (class, Aves). 1, The Eocene family Geranoididae and the early history of the Gruiformes". American Museum Novitates (2388). hdl:2246/2598. ↑ Wetmore, Alexander (1930). "The Age of the Supposed Cretaceous Birds from New Jersey" (PDF). Auk. 47 (2): 186–188. doi:10.2307/4075921. JSTOR 4075921. ↑ Baird, Donald (1967). "Age of Fossil Birds from the Greensands of New Jersey" (PDF). Auk. 84 (2): 260. doi:10.2307/4083191. JSTOR 4083191. ↑ Cracraft, Joel (1972). "A New Cretaceous Charadriiform Family" (PDF). Auk. 89 (1): 36–46. doi:10.2307/4084058. JSTOR 4084058. ↑ Wetmore, Alexander (1932). "Two Primitive Rails from the Eocene of Colorado and Wyoming" (PDF). Condor. 33 (3): 107–109. doi:10.2307/1363575. JSTOR 1363575. ↑ Varricchio, David J. (2002). "A new bird from the Upper Cretaceous Two Medicine Formation of Montana". Canadian Journal of Earth Sciences. 39 (1): 19–26. doi:10.1139/e01-057. 1 2 Storer, Robert W. (2000). "The systematic position of the Miocene grebe Thiornis sociata Navás". Ann. Paleontol. 86 (2): 129. doi:10.1016/S0753-3969(00)80003-8. ↑ Cracraft, Joel. "Systematics and evolution of the Gruiformes (class Aves). 3, Phylogeny of the suborder Grues". Bulletin of the American Museum of Natural History. 151: 1. hdl:2246/597. 1 2 Murray, Bertram G., Jr. (1967). "Grebes from the Late Pliocene of North America" (PDF). Condor. 69 (3): 277–288. doi:10.2307/1366317. JSTOR 1366317. ↑ "A Pleistocene avifauna from Jalisco, Mexico". Contributions from the Museum of Paleontology, University of Michigan. 24: 205. 1 2 Jehl, Joseph R. Jr. (1967). "Pleistocene Birds from Fossil Lake, Oregon" (PDF). Condor. 69 (1): 24–27. doi:10.2307/1366369. JSTOR 1366369. ↑ Wetmore, Alexander (1933). "Pliocene bird remains from Idaho". Smithsonian Miscellaneous Collections. 87: 1–12. ↑ "grebe". Encyclopædia Britannica. Retrieved 27 August 2011. ↑ Boyd, John (2007). "NEOAVES- COLUMBEA". John Boyd's website. Retrieved 30 December 2015. ↑ Haaramo, Mikko (2007). "Aves [Avialae]– basal birds". Mikko's Phylogeny Archive. Retrieved 30 December 2015. ↑ "Taxonomic lists- Aves". Paleofile.com (net, info). Retrieved 30 December 2015. ↑ Çınar, Ümüt (November 2015). "04 → Cᴏʟᴜᴍʙᴇᴀ : Pʜᴏᴇɴɪᴄᴏᴘᴛᴇʀɪfᴏʀᴍᴇs, Pᴏᴅɪᴄɪᴘᴇᴅɪfᴏʀᴍᴇs, Mᴇsɪᴛᴏʀɴɪᴛʜɪfᴏʀᴍᴇs, Pᴛᴇʀᴏᴄʟɪᴅɪfᴏʀᴍᴇs, Cᴏʟᴜᴍʙɪfᴏʀᴍᴇs". English Names of Birds. Retrieved 30 December 2015. Wikimedia Commons has media related to Podicipedidae. Wikisource has the text of the 1920 Encyclopedia Americana article Grebes. "Grebe". The New Student's Reference Work. 1914.